Bargaining for your live octopus at Noryangjin is half the fun. 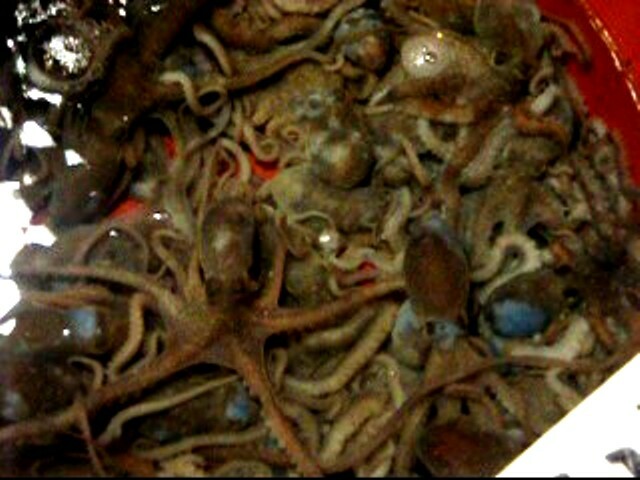 Eating live octopus in Korea is a delightfully scary and delicious experience. The best place to experience eating raw fish (sannakji hoe), and especially raw live octopus (낙지) is none other than the famous Noryangjin Seafood Market in Seoul. Noryangjin is one of Korea's largest fish markets with a raw fish market operating 24 hours a day 365 days a year. After arriving at the Noryangjin market from subway line No. 1, I was overwhelmed by the amount of seafood that this enormous building houses. Just looking at the billions of pounds of sea food got me wondering if there are any fish left in the sea at all (and I am no animal rights activist)! 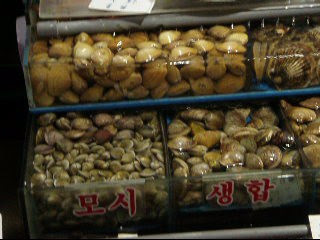 Huge tanks of clams are among hundreds of types of seafood at Noryangjin. A view of Noryangjin seafood market at 1:30 am on a cold Friday morning. After purchasing your octopus, head on over to one of the many hidden and often underground restaurants in the market. Sometimes the fish dealer will take you right there which happened in my case. At the restaurant, they will wash and serve up the raw and wiggling octopus with some tangy sauces and lettuce for a cheap price. Freshly made pastries and desserts are Amandier's specialty, and hudreds of macaroons are made daily. This article can also be read at www.goneseoulsearching.com. The pastry shop/restaurant has a lavish interior to suit its upscale menu. Nestled between historical Insadong, grand Gyeongbokgung palace, and cozy Samcheongdong lies a little slice of European heaven called Amandier. According to Ten Magazine, Ruben Jan Adrian is a Dutchborn 29 year old pastry chef. With experience working in locations such as Paris, Singapore, and Brussels, Adrian had plenty of experience before opening Amandier just three short months ago. Just looking through Amandier's upscale storefront will make your eyes grow wide. There are hundreds of colorful macaroons, decadent chocolates, and pastries so beautiful that you will truly be afraid to touch them. Of course there are fresh bakery items offered each day, and Monday-Friday you can order a lunch sandwich with a free coffee. The eggs benedict: poached eggs, fresh ham, and sinful Hollandaise sauce. Although the restaurant is limited to salads and sandwiches during the week, there is a small and affordable weekend brunch menu offered on Sat-Sun from 10am - 4pm. Don't miss out on this menu! There are only four items and they're all made with perfection: the belguim waffle with maple syrup and butter, a waffle with cafe Americano, waffle with ice cream and cafe Americano, and eggs benedict. The eggs benedict has perfectly poached eggs and a sinful Hollandaise sauce. The spinach added as a layer in between, is a much needed healthy and fresh addition to the buttery concoction. And don't worry, you can get this perfect dish for only 8,000 won! Chef and owner Ruben Jan Adrian working hard in the kitchen on a Sunday. The coffees and teas at Amandier are a little pricey at an average of 5,000 per cup. I recommend skipping the caffeine, and putting that money towards an extra pastry item such as the fresh raspberry macaroon, or a freshly baked carrot multi-grain muffin. Walk across the street from Insadong Station Exit 6. If your looking at Gyeongbokgung Palace simply make a right on the main street and the restaurant will be a two minute walk. The salad bar is buffet style in includes hot food items. A bowl of chicken porridge accompanied by a sweet potato. Seven Springs has a deliciously health conscious menu and everything in the restaurant is homemade. With vegetables delivered every morning, the salad bar has the freshest ingredients you will find in Seoul. Just picture long and lean pieces of asparagus that snap and have a perfect crunch with each bite. Seven Springs has a menu for ordering, but I suggest paying the standard salad bar fee which is just like a buffet. The price is only 16,700 for the lunch salad bar (buffet) and 22,700 for the dinner salad bar. The word salad bar is misleading, because with the one fee you will get access to not only the enormous salad bar, but hot food dishes, appetizers, dessert, and drinks. Yes I know what your thinking, buffets are disgusting. But buffets in Korea are usually fantastic, and Seven Springs is one of the top tier buffet style restaurants around. The salad bar options are always changing from afternoon to night. But here are a few of your options around lunch time. I couldn't resist loading a little bit of everything on my salad! Start with an enormous salad; grab one of the individual wooden salad bowls and load up on more fresh veggies than you can possible imagine. There is also fresh lox available, nuts, capers, chicken, shrimp and several types of dressings. The possibilities are almost so overwhelming I suggest making a few different small salads so that you don't overload one salad and have a mismatched smorgasbord. The salad bar is hard to get over, but make your way to the hot food sections. The sweet potatoes are perfectly cooked and are topped with a light cheese on top that is irresistible. Get two, because you will want more. Also try out the grilled vegetables. The pumpkin I had was a little tough, but the eggplant and zuchhini were perfectly seasoned and grilled in extra virgin olive oil. The sea food pasta came with fresh mussels and tomatoes. There is also a wide range of sea food and meat dishes. You can choose from standard chicken fingers, which are the most unhealthy item offered in the restaurant, to giant bowls of steamed mussels. The mussels are delicious, but be prepared for an Asian peppery taste, rather than a Italian garlic taste. Also try out the different soups and porridge's. The chicken porridge goes along great with a side of olives and kidney beans. The green tea cookies are a crunchy treat. The dessert can be a little disappointing depending on what items you choose. Stay away from all the cakes (except the cheese cake), because Korea simply doesn't know how to make real icing or cake batter. The green tea cookies on the other hand are a nice crunchy snack and go along great with a parfait. The plain yogurt clearly tastes homemade with its smooth and sweet qualities. There are also individual bowls for ice cream, pecan pies, brownie pieces, and small carrot cake pieces. A definite must is trying out the honey lemon tea. This is not standard dry tea that comes in a tea bag or with a filter. This tea is thick and has whole pieces of lemons floating in the bottom of the pitcher. There are seven locations in Seoul. One of the largest and most beautiful is the location in Jongno. Simply exit number 1 from Jongno 3 Sam-ga and walk straight. At the end of Topgol park, (Pogoda will be across the street) turn left at the cross walk. Cross the street again so that you are outside of Giordano clothing store and turn left. Seven Springs will be only 20 seconds away on your right. Seven Springs looks surprisingly deceiving from the outside. You will only see a small entrance with a green awning and brick. But once you enter you will go down a beautiful brick corridor which will lead you to an expansive open and friendly atmosphere. Don't be deceived by the small storefront. Burger N Shake is all about their fresh ingredients and exotic burger menu. There's nothing more appealing than seeing a tiny little Korea girl chow down on a good old fashioned cheeseburger and shake. If your in the mood to just flat out eat something greasy and terrible for your body, head on over to Burger N Shake located in Sinchon. Down the street from Megabox, this is a great restaurant to stop at before or after heading to the movies. This restaurant boasts its slogan of 100% beef premium homemade burgers, which are definitely a step up from McDonald's and Burger King. I was not planning on eating at Burger N Shake, rather I stumbled upon its storefront while looking for fattening food to cure a rough Saturday at work. The interior will draw your attention from the street with its giant pictures of fresh burgers and the catchy name blown up in bright red and orange colors. The mushroom burger comes dripping in tangy BBQ sauce. The menu at Burger N Shake is clearly all about the burgers. You may choose from a classic cheeseburger to a New York steak burger, a bulgogi burger, a whole shrimp burger, a Mexican chili burger, and many more. I ordered up the mushroom steak burger which came piled high with giant oyster mushrooms and dripping in delicious BBQ sauce. My burger was sloppy and wet just like a messy burger should be. The cheesy fries aren't anything special to celebrate about. The french fries look amazing on the pictures, but I'd suggest passing on these. They are not very crispy, and the cheesy fries come with cheap nacho cheese and Parmesan that Italians wouldn't dream of eating. The milkshake was also mediocre as it was more like a vanilla slushy snow-cone. Clearly there was no real ice cream used in the shake and it was much to icy and healthy for my taste buds. Try the mango or kiwi shakes which are much nicer than the traditional milk shakes. Overall stick with the burgers at Burger N Shake and you will be deeply satisfied. The quality really is that good, and you can tell that the meat is fresh and pure beef. The lettuce, tomatoes, and onions are stuffed in the middle of a perfectly crisp hamburger bun, which is hard to come by in Korea. The prices are pretty reasonable for a nicer burger restaurant. You can order a combo meal which includes a cheese burger and fries from 5,000 to 9,000 depending on the burger type. The New York Steak burger is the most expensive and comes in at an assumed 5,900 for just the burger. The milkshakes are 3,000 won and basic french fries are 2,500. The portions are generous and you will have a bulging stomach by the time you walk out the door. Burger N Shake truly reminds me of the family owned chain In-N-Out which is un-arguably the best fast food burger place located in California, Arizona, and Nevada. The ingredients are fresh, and that's what really counts. Learn more about Burger N Shake at their website www.delishburger.com. Korea has just about any kiwi you can imagine including sweet red kiwi. The first time I came to Korea over a year ago I was staying with a Korean host family. Every night after returning home from adventuring around Seoul, my host Mom would set out a huge plate of fruit for her daughter and I. Most of the time there were delicious little slices of golden kiwi, which I had tried for the first time at her home. Never had I tasted such sweet and succulent kiwi in my entire life. Now back in Seoul, I found myself craving golden kiwi. Luckily almost every where you go shopping there are tons of kiwis. From the regular green kiwi's that I am familiar with, to the golden kiwi's and even red kiwis. The green kiwis are the cheapest to buy. You can get a huge pack of about 12 of them for around 5,000 won at E-mart or your local grocery store. The most expensive kiwi's are the golden ones. They are imported from New Zealand and cost around 1,500 won per kiwi! Although they are the most expensive, the sweet taste is worth every penny. So once in a while I splurge and treat myself to these little golden gems. Often times the box will come with a special treat attached such as a kiwi spoon to help you peal the skin off. In the middle price range at 3,200 won for are the beautiful red kiwis. They are very similar in taste to the golden kiwis, because they have a sweeter taste than green kiwis. The middle of each kiwi has a pretty red interior surrounded by a gold color. They are not as sweet as golden kiwis, but are just as delicious. Why eat cereal when you can drink it? One morning while teaching a very low level Talk Time 2 class, I noticed one of my students named Irene drinking Denmark Morning Cereals Milk. As a cereal lover, (I ate Cheerios for breakfast this morning) this drink fascinated me. "So what is this drink?" I asked my student. She replied that the milk tastes just like your eating milk and cereal. Of course I thought this was crazy. Why on earth would I want to drink a carton of cereal flavored milk? The idea is just too crazy for me. Plus, if you look closely at the carton this milk cereal stuff says it is blended with nineteen cereals! Who on earth would want to taste nineteen different types of cereal at the same time? So of course I promised my student I would have to try this milk sometime. Meanwhile I completely forgot about this magic milk cereal. Two weeks later on December 1st I started a new month of classes. I showed up to teach a Talk Time 3 class not knowing who would be in my course. The students didn't even know who their teacher was going to be until I walked in the door. And behold, the second I enter the classroom Irene has a box of Denmark Morning Cereals Milk on her desk. She proudly offered it to me and I accepted it with gratitude and excitement! So what do I think of this milk? Alright it is a little strange at first. But towards the end of the carton I started to get used to the flavor. This is a neat solution for those that have little time to eat breakfast in the morning, or for those that simply do not want to do dishes! The taste wasn't so bad, it tasted like a healthy protein drink, and of course like cereal. However, this drink cannot replace the delicious taste and crunchy texture of my Honey Nut Cheerios. This milk cereal drink can be purchased in Korea at pretty much any convenience or grocery store for about 2,000 won depending on location. Yakgwa is a traditional Korean dish. This cute little cookie is made from only 3 ingredients: honey, sesame oil, and wheat flour. How can something with only 3 ingredients be such a problem in my life? I simply cannot stop eating these perfect and not to mention beautiful cookies. Especially when they are bite sized and seem to be a match made in heaven for a cup of green tea. Yakgwa can be purchased throughout Korea at specialty Korean restaurants where they are made by hand, or at your local Mini Stop. Everyday on my walk to and from work there are dozens of freshly made yakgwa sitting outside of traditional Korean bakeries in Jongno. They are very inexpensive and will cost you about 1,000 won for three large cookies. If you buy a small package of mass produced yakgwa from a Mini Stop they will only cost 600 won! Freshly made honey cookies will be very soft and moist on the inside. Usually when I buy them from one of the bakeries they are dripping with honey and there is actually condensation inside the package. However this honey is not like the super sweet and over-processed honey that we have back in the States. It is a light and delicate taste which compliments the chewier shell. The problem with these cookies is, that they are not so sweet so I actually find myself eating more and more because my stomach doesn't feel sick from too much sugar! Luckily, my body doesn't regret all of these cookies because they are actually said to be healthy for you. In Korea during the Joseon Dynasty yakgwa was referred to as a medicinal confectionery. This is because honey was considered extremely good for your health, which still holds some truth today. Most of us would love to go to Costco in Seoul and pick up a huge turkey for Thanksgiving, the only problem is that we don't have ovens. If your like any other expat living in Seoul with a washing machine in your kitchen instead of an oven don't worry. There are plenty of restaurants here that have Thanksgiving dinners for the big day. If you work a night shift and can't make one of these dinners don't worry; there are also a few options to celebrate on Saturday. This buffet offers turkey with herb stuffing, cranberry sauce, mashed potatoes, pumpkin pie, apple strudel, and more. This is not only for Thanksgiving, it runs through December 31st. The cost is a steep W165,000 plus 10% service charge which will run you about W195,000. A 2 days notice is required so email grandseoul@hilton.com or call 02-2287-8271 to make your reservation. This Thanksgiving dinner includes a glass of champagne and a glass of wine. The buffet begins at 6 pm and costs W70,000. There is a 2 day notice required so email grandseoul@hilton.com or call 02-2287-8271 to make a reservation. Since Suji's is a well known restaurant catering to the expat scene in Itaewon of course there is a Thanksgiving buffet. There will be fresh green salad, seafood chowder soup, roasted turkey, gravy, cranberry sauce, cornbread sausage stuffing, herb stuffing, grilled mixed vegetables, mashed potatoes, pumpkin pie, and a glass of wine or apple cider. There are two sittings, one at 5:30 – 7:30 pm, and another at 8 – 11 pm. The price is average for adults, about W45,000 – W50,000, and children get a cheaper meal ticket at W25,000 – W30,000 (excluding tax). There is a non-refundable cash deposit (20%) to be paid if you have over 5 people at your table. Reservations are required 02-797-3698 and keep in mind that Suji's is always crowded as it is, so expect a very crowded and less intimate Thanksgiving celebration. Spend the night in Sinchon at a foreign owned bar watching football games while you eat turkey! This is a more low key Thanksgiving which includes dinner, 2 draft beers, and dessert. The restaurant opens at 5 pm, and dinner starts at 7 pm and lasts until 2 am. The price is a reasonable W40,000 and tickets can be purchased at the bar. Visit their website http://www.beeroclock.ca/ or call 02-333-9733. This Thanksgiving feast is popular among the younger expat scene. There will be deep fried turkey with stuffing and all you can eat buffet. The first session starts from 5 – 6:30 pm for a low price of W35,000. The second session starts from 7:30 – 9:30 pm for a more expensive price of W50,000; however this includes all you can eat/drink food and beer. Past attendees have stated that by the end of the night there is all you can drink bottles of wine! Make a reservation by sending an email to info@bigrockbeer.co.kr or calling 02-539-6650. O’ngo Culinary School located in Insadong will have a potluck Thanksgiving Dinner on Saturday Nov. 27th from 3-7 pm. 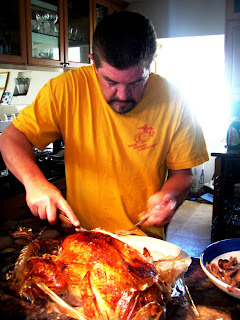 There will be all-you-can-eat turkey and side-dishes. At only W30,000 a person, this is by far the best priced feast in Seoul and if if you bring a homemade dish you can save W10,000. RSVP at dan@ongofood.com or call 02-3446-1607. Check out their Meetup group to see who else will be going at the Seoul Eats Meetup page. Vapianos is the best Italian food I have had so far in Seoul. With locations in 39 countries, Vapianos has set out to show the world what fresh and authentic Italian food should be like. All of the food at Vapianos is made to order. Upon entering the restaurant you receive a swipe card and are seated. Then you take your swipe card and order your food at one of the many stations which include pasta, pizza, salad, dessert and wine bar. The cute Korean chefs are happy to take your order and customize your meal as they cook everything right in front of you. You can stay and watch them cook your meal, or you can return to your table and they will serve you. All of the prices are very reasonable and you can have an appetizer, main course, wine, and dessert for around 30,000 won per person. I recommend ordering the bruschetta for an appetizer only 4,000 won, and the carbonara pasta as a main course. The carbonara is only 12,000 won and comes with fresh Parmesan cheese, a light creme sauce, egg, and bacon. Definitley save room for dessert. The panna cotta is topped with raspberry and is served in an adorable mason jar. As a pretty picky Italian eater, I was pleasantly surprised with how fresh and simple the ingredients were at Vapianos. This is one of those restaurants where you want to savor every single bite; and you are so satisfied that you might even leave a little food on your plate so that you don't feel too full! The wine selection at Vapianos is truly amazing without breaking your budget. Order a glass of the Barbera D'Asti for only 8,800 won which comes from the province of Asit in northern Italy near Torino. My good friend Andrea drank this wine every week when she lived in Bologna. This red wine is stored in oak barrels which gives it a sweet yet deep and robust flavor that goes good with almost anything on the menu. The coolest part of Vapianos its signature style. They are known for their color red, and providing an urban and upscale interior. Each room has its own style, while keeping with the natural atmosphere. There are hundreds of fresh basil plants throughout the restaurant and if you want you can go ahead and pick your own to eat; however there will be plenty of fresh basil on anything your order! This is one restaurant where you can get lost in time. I spent about two hours soaking in the low key yet modern atmosphere. The hip fire place and dim lighting throughout the restaurant made me feel right at home. Not to mention the outstanding service of the chefs, waiters, and clerks who were always checking to make sure you were absolutely perfect. There are three Vapianos located in Seoul. Personally, I recommend the location in Gangnam. Simply take Line 2 and exit no. 5 where Vapianos will be directly on the corner on the second floor above the Smoothie King. Gangnam is known for being the much newer and upscale Manhattan part of Seoul, and Vapianos is a perfect way to experience what Gangnam has to offer. Still curious about Vapianos? Visit their international website at www.vapianointernational.com. Finally, thanks to Christine one of my coworkers students at YBM for sharing Vapianos with us and showing us a great night out in Gangnam! If you have any other questions or comments about Vapianos please leave them in the comment box below or email seoulfoodgirl@gmail.com. A freshly made ham sandwich from Suji's. Suji's truly is a New York style restaurant that lives up to their motto "The next best thing to mom's home cooking." With one restaurant in Tokyo, and three locations in Korea, Suji's is building a very popular fan base. The Suji's located in Itaewon is well known for their all day brunch and sandwich menu. There is no other restaurant in Seoul where at 8 pm you can order an enormous country style pancake for 12,000 or eggs benedict for 15,000. The deli at Suji's is just like an old fashioned New York style mom and pops sandwich place. The pastrami sandwich is always on the menu. But on Wednesday nights after 5pm you will receive an extra 100 grams of meat turning this already big monster into a massive 300 gram sky high sandwich. My mouth is watering just thinking about all of this fresh pastrami for 15,000! If you still weren't full after all that meat, you can take home some fresh meat from deli on the first floor. Of course the prices are a little steeper then going to Subway. But you are getting real sandwich meat here people! If you've been in Korea for a while now, you know that the only lunch meat you can find at the grocery store is Spam or very processed ham. And in all reality, the prices are not that much more than a very nice Korean, Italian, or any other restaurant. All of Suji's food is made from scratch, and you can definitely tell that the cooks know what their doing. Sometimes I am surprised at how well this restaurant has mastered Western favorites such as shepard's pie, and meatloaf. If you ever get homesick while living in Seoul, Suji's is the place to go! The menu is pretty extensive, and also offers many pasta dishes such as parmigiano pasta with eggplant, and Mexican food such as chili cheese nachos. I swear that the salsa at Suji's is the closest thing to pico de gallo that you will find in all of Korea! A really cute cartoon on the menu! Die hard Suji's lovers are a part of the restaurants VIP Club which gets them an extra 10% discount ever time they visit. Some of these fanatics are pictured on the VIP section of Suji's Website. Make sure to reserve a table in advance at Suji's, especially on weekends. Even at three stories high, the restaurant gets packed with foreigners getting their home cooked fix. The service is some of the best I have seen in Korea, however it did take about 45 minutes before I was served on a Saturday evening. So plan to spend some time hanging out with friends and enjoying some cocktails before eating. Hats off to my student Kim who hooked my co-workers and I up with a Suji's VIP Card! If you have any questions or comments about Suji's please leave them in the comment box below or email them to seoulfoodgirl@gmail.com.